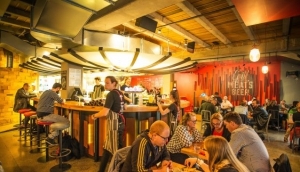 Casual Dining in Wellington is easy to come by. It's a laid back city, so you won't have to go far to find a great waterside eatery, a cosy CBD cafe, or some suburban peace and quiet. Wellington's family friendly, too, so indulge the kids. Wellington Casual Dining takes many forms. Fast food restaurants abound, especially in the CBD, along with pizzerias, cafes, lunch places and takeaways. Cuba Street is where most people go to grab a quick bite, or sit and watch the world go by with something easy and satisfying. It's pedestrianised, so the vibe is casual and fancy free, and you can get a whole range of ethnic cuisines here. Lambton Quay has plenty of casual eateries, and is a good place to go, as the locals go about their business. Down by the Waterfront you'll find more upscale restaurants. If you fancy stretching your legs, wander out to Mount Victoria, where you'll find some great pub grub and plenty of bars that sell food.